Jan Knodel, NDSU Extension entomologist, shows how to use the sweep net to find out if adult alfalfa weevils are present. Here is a photo of the adult alfalfa weevil. NDSU photo. Producers and others listen to Jan Knodel, NDSU Extension entomologist, talk about the alfalfa weevil at DREC field days. DICKINSON, N.D. - Sweeping a net in a 180-degree circling motion “over and down” above alfalfa fields bursting with tiny lavender flowers at North Dakota State University's Dickinson Research Extension Center's field day, Janet Knodel, NDSU professor and Extension entomologist, demonstrated how to determine if the alfalfa weevil was in the field. Using a 15-inch sweep net only tells a producer if the alfalfa weevil has emerged. Scouting the field is the best method to find out if there has been economic injury caused by alfalfa weevils. The alfalfa weevil, while about a quarter-inch long, can be very destructive, with yield losses approaching 100 percent. This is especially true in dry years. At DREC’s field days, Ryan Buetow, DREC Extension agronomist, said the alfalfa weevil was not an issue in 2018 in the southwest. “However, we have had issues in the past with the alfalfa weevil, especially in 2017 during the drought,” Buetow said. In 2017, Kurt Froelich, NDSU Stark/Billings County Extension agent, and Tim Fine, Montana State University Extension agent in Richland County, noted that there was damage from the alfalfa weevil in both their regions. The pest has been a problem for a long time, especially in western North Dakota, eastern Montana, and areas of Canada. “This year, we are seeing a lower population of alfalfa weevil and part of that may be due to the cold winter. Cold temperatures can decrease the overall weevil winter survival,” Knodel said. A tiny parasitic wasp is known to attack the alfalfa weevil and is beneficial to alfalfa producers, providing natural control of the alfalfa weevil. “In some survey work, researchers have found about 37 percent parasitism rate for alfalfa weevil in the North Dakota and Montana alfalfa growing regions. So, parasitoids may also be playing a vital role in reducing the alfalfa weevil populations this year,” she said. Good moisture in 2018 helped the alfalfa crop grow fast. “In some cases, it outgrew the destructive feeding injury from alfalfa weevils,” Knodel said. In addition to the alfalfa weevil, growers might also spot sweet clover weevil in their alfalfa weevil. It is not as damaging as the alfalfa weevil. “They are not the same, and it is possible to confuse them,” Knodel said. Like all weevils, the alfalfa weevil has a long nose, and is brown with a dark brown band down its back. The alfalfa weevil overwinters as an adult, emerging from May through June. The hottest May on record in North Dakota was May of 2018, and many adult alfalfa weevils emerged earlier than expected in May. “With good heat and moisture, the alfalfa crop was in good condition for an early harvest. Many growers cut the alfalfa early to reduce the alfalfa weevil populations,” she said. Cutting alfalfa fields early is one of NDSU Extension’s best recommendations to prevent damage from the alfalfa weevil. Early cutting does not negatively impact parasitic wasps or pollinators, another benefit. After adults emerge in the spring, they lay eggs right into the stem of the alfalfa plant. Depending on temperature, the larvae come out in the summer and feed for two to three weeks. Larvae are very tiny when they hatch but grow to be about 3/8ths of an inch long, and are light green, with a white stripe down their back. “The larvae do the most damage to the crop. They feed on the leaves, at first putting a small pinhole in the leaf, but the feeding injury grows larger and larger, causing more defoliation,” she said. After feeding for about three weeks, the larva then pupates, which is a resting stage, for one to two weeks. The adult emerges from the puparium in mid-summer and feeds for a short period of two weeks. Then, these weevils enter summer dormancy until fall. In the fall, adults become more active but feeding is not economical. They overwinter in places where vegetation is heavy, such as tree rows. Alfalfa weevil development is dependent on temperature. Knodel encouraged producers to use the degree-day model from NDSU, so they would have an idea on when to start scouting for the alfalfa weevil. The “Insect Degree Days” model can be found on NDAWN at https://ndawn.ndsu.nodak.edu//insect-degree-days.html. Here, producers are able to select for their nearest weather station. They can also check the NDSU Extension “Crop & Pest Report” during the growing season for statewide alfalfa weevil degree-day maps. NDAWN uses 48 degrees Fahrenheit (F) as the base developmental temperature to forecast when adult will be emerging, eggs hatching and larvae developing. “You can use that (accumulated degree days) to time your scouting. Look for the adults when they first come out in the spring, which is 250 accumulated degree days,” Knodel said. Larvae pass through four different development phases as larva, from 370 accumulated degree days at the start, to where the mature larva feeds and is the most damaging, at 500-600 accumulated degree days. Reviewing the scouting procedures for alfalfa weevil, Knodel showed producers how to check their fields for the presence of alfalfa weevils, sweeping the net quickly back and forth through the alfalfa. But after sweeping and finding the weevils, producers should begin scouting and using the stem-sampling method. At each sampling site in the field, select at least 30 stems and cut them off at the base. Producers should count and record the number of stems sampled, count the total number of larvae and measure the height of the alfalfa at the sampling sites. When finished, total the number of larvae and divide by the total number of stems sampled to calculate an average number of larvae per stem for the entire field. Then, check the economic threshold table for the number of alfalfa weevil larvae per stem based on crop value, plant height and treatment costs prior to the first cutting. This fact sheet is available online at https://www.ag.ndsu.edu/publications/crops/integrated-pest-management-of-alfalfa-weevil-in-north-dakota. 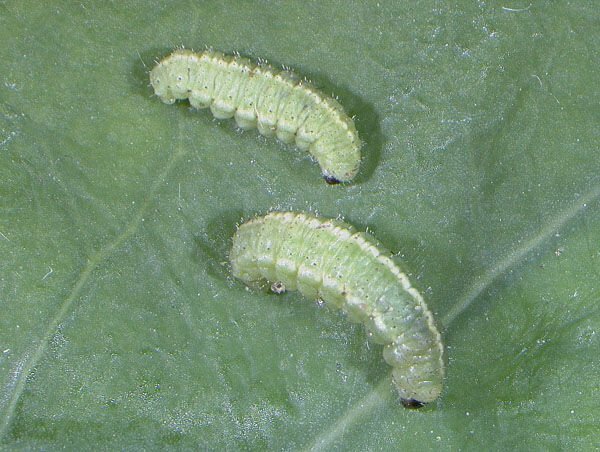 If any of the economic thresholds are met, and larvae are continuing to feed, producers can use one of several insecticides registered for control of the alfalfa weevil. “An insecticide with a long residual works best, such as one of the pyrethroid insecticides, 3A group,” she said. Some insecticides will only be around for three to five days, and are not long enough to control late feeding injury by alfalfa weevils. Knodel recommended producers view the alfalfa weevil fact sheet E1676 for a listing of insecticides registered for alfalfa weevil control. The alfalfa weevil is one of the main insect pests in alfalfa fields, especially in drought years.